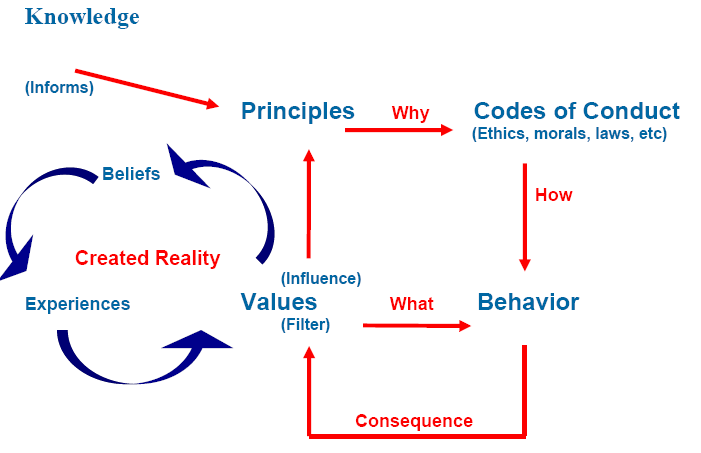 Minessence Values Framework [MVF] Knowledge-Base: What's the Difference Between Values, Ethics & Principles? The short answer: "Values motivate, ethics and morals necessarily constrain (because we live in a society, we cannot live our values any way we want)." Values describe what is important in a person's life, while ethics and morals prescribe what is or is not considered appropriate behaviour in living one's life. 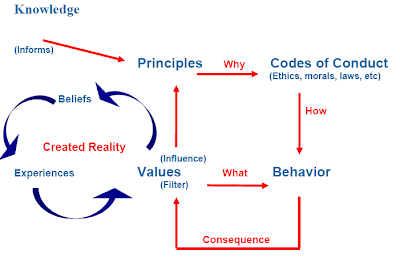 Principles inform our choice of desirable behavioural constraints (morals, ethics, rules, laws, etc.). ...we are more likely to make choices that support our value systems than choices that will not. Let us say that financial security is a strong value for an individual. When faced with a choice of jobs, chances are the individual will carefully examine each organisation for potential financial and job security. The job applicant who values financial security may well take a lower salary offer with a well established company over a higher-paying offer from a new, high risk venture. Another job seeker with different values, possibly adventure and excitement, might choose the newer company simply for the potential risk and uncertain future. Values, therefore, become part of complex attitude sets that influence our behaviour and the behaviour of all those with whom we interact. What we value guides not only our personal choices but also our perceptions of the worth of others. We are more likely, for example, to evaluate highly someone who holds the same hard-work value we do than someone who finds work distasteful, with personal gratification a more important value. We may also call the person lazy and worthless, a negative value label. Concepts such as material success, individualism, efficiency, thrift, freedom, courage, hard work, prudence, competition, patriotism, compromise, and punctuality all are value standards that have varying degrees of potency in contemporary American culture. But we probably would not view them primarily as ethical standards of right and wrong. Ethical judgments focus more precisely on degrees of rightness and wrongness in human behaviour. In condemning someone for being inefficient, conformist, extravagant, lazy, or late, we probably would not also claim they are unethical. However, standards such as honesty, truthfulness, fairness, and humaneness usually are used in making ethical judgments of rightness and wrongness in human behaviour. To summarise then, values are our measures of importance, whereas ethics represent our judgments about right and wrong. The close relationship between importance and right and wrong is a powerful influence on our behaviour and how we evaluate the behaviour of others. Q. How does one go about choosing what ethics, morals, rules, laws, etc. are 'right'? A. By basing them on appropriate principles. Principle is defined in Nuttall's Concise Standard Dictionary of the English Language as, "Principle. n the source or origin of anything; a general truth or law comprehending many subordinate ones; tenet or doctrine; a settled law or rule of action; v.t. to impress with any tenet; to establish firmly in the mind." One way in which drowning in information is overcome is by the discovery of principles and theories that tie up a lot of information previously untied. Prior to Charles Darwin biology was a mass of unrelated facts about nature. Darwin tied them together in a mere three principles of evolution: random genetic variation, struggle for existence and natural selection. So we do not need to teach every detail that was taught to nineteenth century students. A mere example is necessary to illustrate the universal principles. Before you raise your voice to protest, "What do scientific principles have to do with informing what constitutes ethical and moral human behaviour?" Stop for a moment and ponder the what has been institutionalised into Western society, all in the name of extolling the virtue of progress through unencumbered evolution--guided by the principles made evident by Charles Darwin: we push for free trade with level playing fields, argue that cloning interferes with natural selection, push for de-regulation so that competition prevails and only the fit organisations should survive, etc., etc. But what if we've got Darwin wrong? What if the principles instead were: survival of those who cooperate for the greater good, selection guided by a moral sense, etc. We would have a completely different society from that which we have today. Internalising the principles we believe explain the nature-of-things is perhaps the single most powerful factor shaping society. It is vital that we maintain a continual dialogue around principles to ensure those we internalise and institutionalise are up-to-date and are our current best shot at the truth. We must work hard to expose those who willingly spread misinformation for their own personal gain--our future depends on it. We are entitled to our own opinions. We are not entitled to our own facts. People become more trusting the more they perceive they are being trusted. The wealth of countries is directly related to the level of trust within the country. The greater the trust level, the greater the wealth. People reject inequality, even if it means walking away empty-handed. Our brain is dichotomous which leads to the fact that many of people's "weaknesses" are a natural consequence of their strengths--rather than try and "fix" these weaknesses, celebrate them. The clearest distinction I've read yet, whilst trying to distinguish between values and principles within politics. Thank you. The above attempt is based on what appears to be a riddle or trick question which I asked the new leader of my country's opposition, "What is more important; the citizen or the state?" No answer yet and I don't expect to get one, so am trying to answer it for myself. Is this a case of comparing apples (principles) with pears(values)? What's the Minessence Group's Take on Memes? How do I Become an Evolved Person?